Kananan and Meimei begin by talking briefly about several subjects including the Obon festival in Japan, their upcoming tour FULL CHARGE and the places they’re most looking forward to visiting on it (Meimei: Okinawa, Kananan: Wakayama) as well as recommended souvenirs — Kananan recommends the two Osakan delicacies takopatie (takoyaki sweets) and butaman (pork buns) from a store called 551 Horai, whereas for souvenirs from Gunma, Meimei recommends Shichifukujin arare (a brand of rice crackers that come in several flavors). Kananan starts the corner this week by reading a letter. Thus, Kananan does as requested and starts reviewing The Grand Budapest Hotel. Kananan says she went to see this film with Fukuda-san, and explains that it’s about a high-class European hotel called the Grand Budapest Hotel. A murder occurs (Meimei: “*gasp! *“), and the protagonist who is a concierge at the hotel is suspected of committing it. The story follows him and a lobby boy who also works at the hotel as they try to find the truth behind the murder. Nakanishi talks about how Western films are sometimes considered difficult to understand by Japanese audiences — Kananan mentions how she’d previously asked Take-chan to watch one with her, but she was reluctant since she hasn’t watched many. (Meimei, on the other hand, says she thinks they’re interesting.) 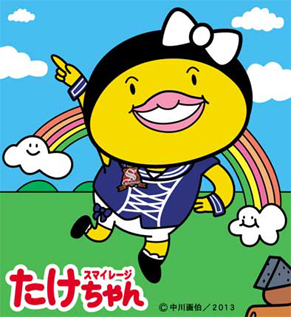 Kananan says she recommends this film especially for people like that since she finds it so comical and cute, and because it’s about human relationships. The film shows you how even complete strangers can with time become as close as family. She says that all ages will find things to enjoy in this film: it’ll make the older audiences think, whereas the kids will be able to enjoy its cute visuals. The two begin the show by repeating their hiatus announcement. Chii asks Kumai-san how it was announcing the news live in front of their fans. Kumai-san says that above all, she just felt very restless before the announcement. Since it was the first time in her life experiencing something like it, she didn’t know what to feel. She apologizes for surprising their fans but says that she hopes to do her very best until their hiatus. Chii says that she’d never felt anything quite like the venue that day — normally when someone would say “we have an announcement regarding Berryz Koubou,” people would just go “eeeeh? !” or something, but this time it felt like everything just went dead quiet. Chii notes that there is still time until next spring and she hopes to make lots of fun memories with their fans until then. The two of them ask once more for everyone’s support. Chii introduces their guest this week as “probably the world’s number one most eager person to be a guest on this show.” Perhaps mirroring the lyrics to “Futsuu, Idol 10nen Yatterannai Desho! ?”, Kanon introduces herself as someone who “devoted her entire youth to Berryz Koubou” — looking back, she explains she’s been a fan of Berryz Koubou ever since her early teens. Chii points out that their guest’s face is all red with embarrassment. Kumai-san calling Kanon cute for this probably doesn’t help in making it any less red, and Kanon asks her not to look. Chii asks Kanon how it is to finally have made it as a guest on the show. She talks about how last time when Wada-chan and Takeuchi-chan came on as guests on the show, she herself was actually busy doing an event where she was talking about Berryz Koubou in front of fans, so she’s happy she could make it on the show this time. Kumai-san says she actually received a message on LINE from Kanon that day, apologizing that she couldn’t come. Chii talks about how, working as the “Berryz PR Ambassador,” Kanon did an episode of SS1422 on March 2nd where she spent 30 minutes just talking about Berryz Koubou. Kumai-san and Chii wonder if there’s even that much to talk about Berryz to begin with, but Kanon assures them that 30 minutes isn’t even nearly enough. 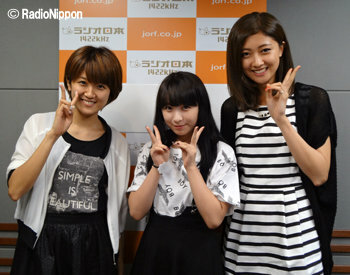 Kumai-san says she couldn’t possibly talk about Berryz for 30 minutes straight, but more than that she finds it funny that Kanon would talk solely about Berryz on a S/mileage radio show. Talking about the ongoing Hello! Concerts, she says she has a habit of dancing harder than usual at them to try and appeal to the audience more since she doesn’t get to be on stage as much as at °C-ute’s concerts. But especially after seeing herself overdoing it a bit in the H!P Countdown concert footage, she’s decided on this tour to try and dance just how she normally would. She says that the KOREZO pattern has a segment in it where she gets to do lots of energetic dancing in succession anyhow, whereas the YAPPARI pattern lets her have lots of eye contact with her juniors which she’s also happy about — she’s previously talked about how she’s very bad at getting to know her juniors. Commenting on the topic of Berryz Koubou announcing their indefinite hiatus, Nacky says she heard the news from Berryz themselves on the day of the concert when they came into °C-ute’s dressing room and announced it to them. Nacky says she just went speechless at first as she could’ve never even imagined it, but now that some time has passed, she says that while she does feel lonely, she also felt how mature they all are and wishes them all to do their best to be happy as they move on to their various paths in life. Even though they only very rarely cry, seeing the members of Berryz all in tears when making the announcement on stage made Nacky think they must’ve really thought it through amongst themselves before arriving at their decision. But on the very next day, she could hear Berryz in the dressing room next to theirs, being back to their usual lively selves. This made her glad, and she thinks Berryz are going to treasure each day even more than usual now as they head towards their hiatus. She hopes the two groups will continue being a motivation to each other until next Spring, and after their paths separate, she says she’s going to keep supporting the members of Berryz Koubou and hopes that the fans will, too.